A garden window is a great way to give the appearance of more space in your kitchen. Garden windows on average project out about 17” from the inside surface of your kitchen wall so you have a lot more area for your plants or knick-knacks. Garden windows are the perfect place to grow fresh herbs or flowers in your own private green house! A garden window is actually four windows in one, a picture window for the roof, another picture window for the front, and two trapezoid casement windows on the sides. Picture windows are normally white on both the inside and outside but can also be tan or beige. Some manufacturers even offer a light oak wood grain finish for the interior. Depending on the size of your garden window there can be one or two shelves, (typically made of polished glass.) or none at all, per your choosing. Grids or grilles between the glass are available but most people choose to leave view as unobstructed as possible. The trapezoid casement windows on the sides of the garden window allow for great ventilation. Garden windows can be double or triple pane and have a variety of Low-E coatings for the glass and argon or krypton gas. If you are going to use the garden window to grow plants it is recommended to go with the best Low-E option available to keep your plants from getting baked in the sun as the roof of the garden window lets in lot of direct sunlight without Low-E glass. Many garden windows offer the option of a laminated seat board for a maintenance free interior. Garden windows are more expensive than flat windows of the same size, but if you remember that a garden window is actually four windows and gives the appearance of opening up the room, it is well worth the additional cost. Call today for a free estimate to see what a magnificently beautiful addition to your home this window can be! 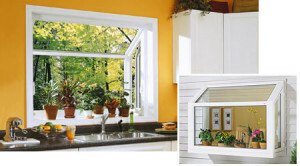 Energy View offers Garden Windows for your next home improvement or new construction project. Call Now for a free estimate! (314) 656-1410.